It’s time to unite two things that kids love – jigsaws and anything with their name on it. I’ve always pushed the love of jigsaw puzzles in my house, because I love doing puzzles and I fantasise about a future rainy afternoon in which all three of my children sit quietly doing puzzles at the table with me while I drink tea, in a perfect family tableau. It hasn’t happened yet, but I push on hoping that one day it will! What they already love though, is ANYTHING with their names written on it. 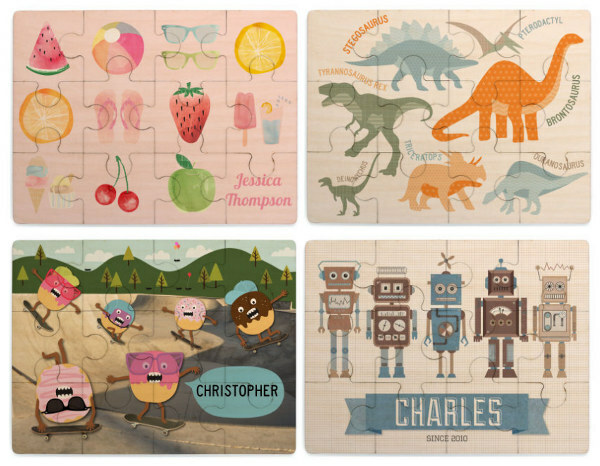 Now Tinyme, that home of all things cute, whimsical and personalised, has turned their hand to jigsaw puzzles. Just like all their other products, there are a huge number of designs to choose from, and when you add to that choice the different colour palettes possible, you’re left with what seems an endless number of jigsaws. You can’t really go wrong though, because it all has that classic, slightly quirky style we’ve come to expect from Tinyme. There are two sizes of wooden puzzle to choose from (twelve or twenty four pieces) so they are a great first puzzle even for quite young children. They come with a soft felt pouch for storage so you won’t even need an enormous shelf to stack all the puzzle boxes on. 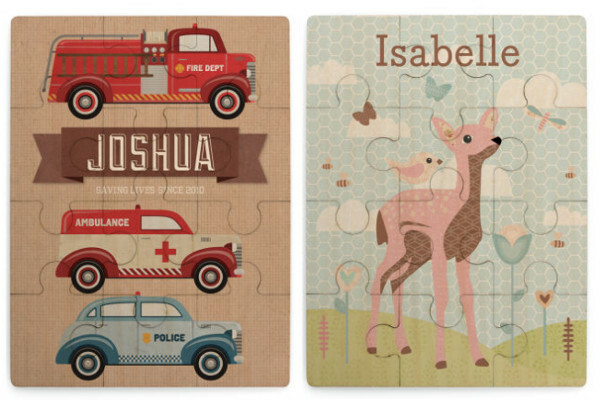 The small puzzles are $24.95 and the large are $34.95 and you can peruse the whole range and pick them up from Tinyme.